The United States Institute of Peace (USIP) has selected Grandview teacher Amy Cameron to serve in the 2017 Peace Teachers Program. The Peace Teachers Program is rooted in the conviction that educators can be pivotal in bringing peace themes into their classrooms, schools and communities. At a time when violent conflict regularly dominates headlines, USIP believes that teachers are the key to helping young people obtain the knowledge, skills and perspectives to envision a more peaceful world and their part in creating it. The Peace Teachers Program selects four outstanding American middle and high school educators each year to receive training, resources and support to strengthen their teaching of peace. Over the course of a school year, these teachers develop their understanding of international conflict management and peacebuilding through online coursework and other USIP opportunities; discover new ways to teach about conflict and peace, and identify concrete actions for integrating these concepts and skills into their classrooms; build connections with like-minded educators and with USIP through monthly virtual meetings; and serve as ambassadors and models for global peacebuilding education in their schools and broader communities by sharing their experiences and strategies on USIP’s website, at conferences of educators, and in a special closing program in Washington, D.C. The program is part of USIP’s public education work. Grounded in the Institute’s original mandate from Congress, public education serves the American people, providing resources and initiatives for K-12 students and educators, as well as others interested in learning about and working for peace. 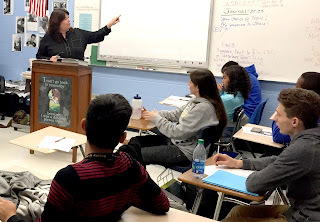 Cameron wrote curriculum for her high school British and World Literature students using the book What Is the What, written by Dave Eggers, which is based on the life of Valentino Achak Deng, a Sudanese child refugee who immigrated to the United States under the Lost Boys of Sudan program. Last school year, after the students read the novel, Cameron invited a Lost Boy from Sudan to come and speak with her classes. Throughout her research for the curriculum, Cameron came across an essay contest through USIP. Having been listed as the sponsoring teacher for student submissions over the years, Chabalowski reached out to Cameron to find out what was happening in her classroom. With many of the Lost Boys from Sudan ending up in the Kansas City area, Cameron’s students are able to relate to their stories. Chabalowski, after hearing from Cameron about her curriculum, convinced her to apply for the Peace Teachers Program. Cameron’s essay focused on how she applies lessons of peace in her classroom in order to help her students feel more connected and to feel that something else is more important than them. Next semester, Cameron will include a project-based learning design in which students will study how to become peacebuilders in the world. While doing an activity that coincided with the International Day of Peace this year, Cameron and her students discovered that 162 nations are currently in some sort of conflict. Each country in conflict will receive a colored tack on the map in Cameron’s classroom, eventually filling most of the map. As one of the four high schools in the country being represented in the Peace Teachers Program, in December, USIP representatives will visit Grandview High School and speak with Cameron’s students. Cameron is excited to see what direction her students take with the peacebuilding lessons. Every day, as Cameron teaches World Literature, she explains to her students different perspectives and that the world is much bigger than the community they live in. Her classes will begin reading What Is the What in February.